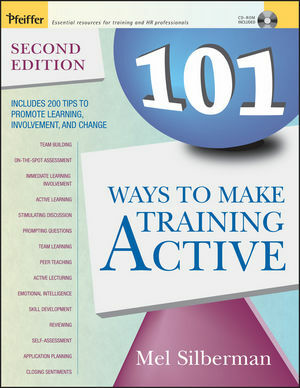 For the first time 101 Ways to Make Training Active features a CD-ROM containing all the original "Top Ten Trainers Tips and Techniques" lists for easy reproduction and distribution. MEL SILBERMAN was professor emeritus of adult and organizational development at Temple University, where he received its Great Teacher Award. He was also president of Active Training, Princeton, New Jersey, a consulting firm that provided courses on active training techniques, interpersonal intelligence, and team facilitation. He was the author and editor of over 30 books, including Active Training, and The 60-Minute Active Training Series.